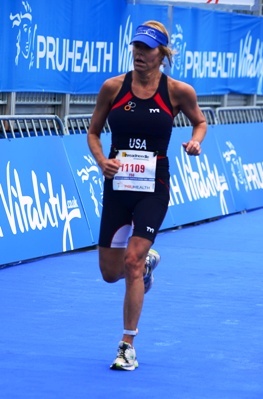 "Gage Total Training has helped me to attain and even surpass my goals in triathlon training and competition." 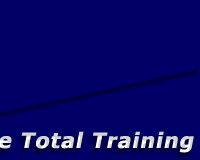 Jane is the head coach of Gage Total Training. 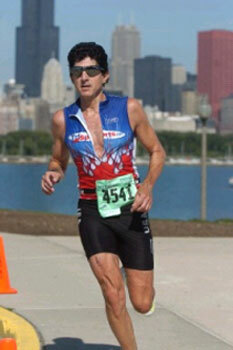 She has been racing triathlons for over 25 years. Her husband George, a 35+ year triathlete, sometimes assists her in running Gage Total Training. Together they have been coaching other athletes for the past 18 years. As athletes themselves, they have excelled* at every distance (sprint to Ironman) and in every multisport discipline (triathlon, duathlon and aquathlon)--so they know first-hand how to get you to where you want to go! In addition to triathlon coaching, they are both certified by ACE as personal trainers. They KNOW training. *Jane and George have qualified and raced at World Championships in triathlon, duathlon and aquathlon. They have competed at World Championships in every triathlon distance: Sprint, Olympic, 70.3 and Ironman. Goguac Lake Champion Wins-40 Years Apart! Reef&Run 1 mile Ocean Swim Series-1st female overall: June 14th, July 5th, July 19th, August 2nd, August 9th, August 16th, August 23rd, and August 30th. 1st Place Age Group finishes at the Ventura Sprint Triathlon. Escape From the Rock Al;catraz Swim, Semana Nautica One Mile Ocean Swim and the McConnells Biathlon. 2nd at the Ignite the Fork Triathlon, Santa Barbara Sprint Triathlon, Clark Lake Triathlon, Redondo Beach Triathlon and HITS Naples Sprint Triathlon. 3rd at Mountain Man Olympic. 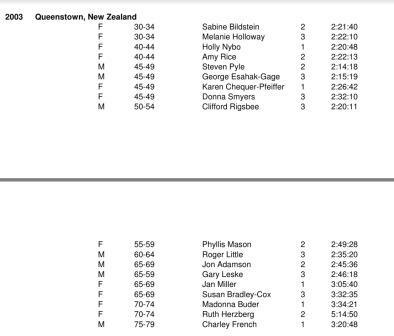 Qualified for the 2108 Age Group Sprint Triathlon World Championship to be held in Australia.